It’s a sunny Sunday afternoon, and I’m crunching pumpkin seeds alongside my hero. His name is Wendell Martin, and he is the iPhone app developer for iMuseCubes. The iMuseCubes development team has decided that it’s time to be more “out” about the iPhone app development process. So get ready, dear readers! From time to time I’ll be posting updates. And since this is the first one, how about a little history of the project? Where Will I Find a Programmer Who Will Work For Free? A year and a half ago, I was overwhelmed with my new life as an entrepreneur. It felt lonely and risky, and I felt adrift. I had so many creative ideas, but I didn’t believe I had the skills or the resources to bring these ideas to fruition. 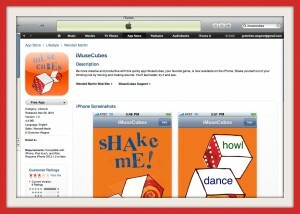 For example, the task of creating an iPhone app for the MuseCubes seemed completely insurmountable! I had no technical skills, no money to hire professionals, and no desire to work alone. A few months later, the very first iMuseCubes meeting adjourned. It turns out that Randy’s friend Wendell is a Java programmer who’d been curious about learning to program on the iPhone. He liked me and enjoyed the MuseCubes. Furthermore, he didn’t need to be reimbursed for his time until after the iMuseCubes began to make money. And Randy was willing to serve as business manager for the project. It turns out Randy was right. The resources were nearby. I didn’t have to work alone. And all I had to do was ask. Amazing! We had a team. But we also had limitations. Wendell, for example, didn’t even own an Apple computer, which is a requirement for programming xcode. We decided that he’d simply come over to my house to work, and thus: a new guideline for collaboration was born: no one was expected to work on the project alone. We would always be accompanied by another member of the team. On the one hand, this isn’t the most efficient way to work. Sometimes weeks would go by without moving forward on the project. Sometimes we’d spend the first half hour of a three hour meeting gabbing… about dating, relationships, job searches, and more. But on the other hand, working together became so much fun!! We both looked forward to our work sessions together. Wendell commented that programming is usually a completely isolating experience during which he’s hunched over a lonely computer in a cubicle or at home. However, the iMuseCubes project was entirely social and creative. We sat next to each other on the couch. I used Wendell’s PC while he borrowed my Mac. I brought him snacks and drinks. We always kept a set of the real MuseCubes nearby, and when programming got tricky, we used them to shake off the stress. Totally fun!! And the best part was: when Wendell left my home, I didn’t have to do any more work on the app. And neither did he. We were free to lead our regular lives. No homework!! What a relief!!! Even this blog post, I’d like to point out, was written while we were working together. It’s hard to believe a year has passed! 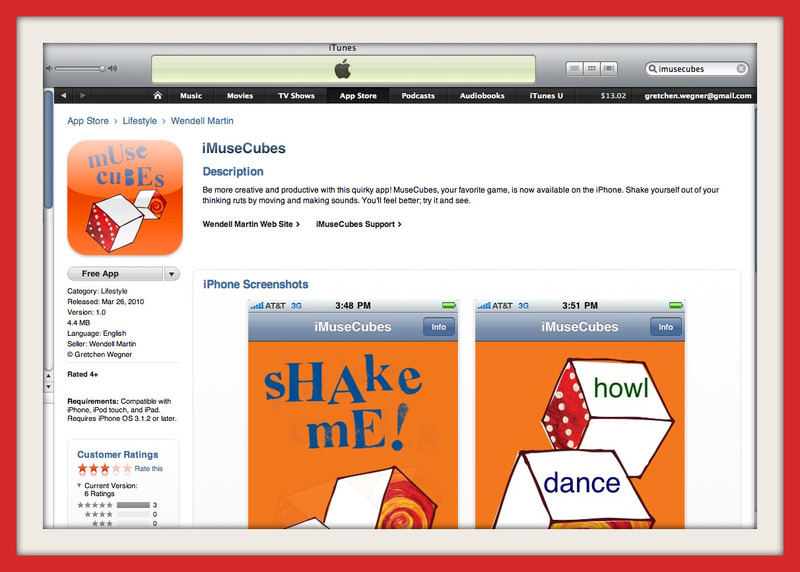 On March 25, 2010 iMuseCubes 1.0 became available as a free app on iTunes. If you’ve got an iPhone, check it out! It’s still a rough version, and we have so much more that we want to do with it. I’ll blog about those plans later. Because we’re still smoothing out the edges on the app, we haven’t done any real marketing (other than a shout out on Facebook, and this blog entry). Without any marketing, though, there are 102 phones who sport the app. And the cubes have been rolled 613 times. Yay!! The resources are all around. Warm bodies working with me are key to collaboration. Slow work is satisfying work. Thank you for sharing this process. I had no idea how you all were collaborating. It is so exciting!